The lighting project will link Roskilde’s new creative quarter with the city centre and train station. The vision and purpose of the Musicon Path, a Demo Lab of the Lighting Metropolis, is to engage citizens of Roskilde City in functional and playful outdoors activities by way of lighting themes. In various lighting schemes along the path, the lighting design responds to the landscape architectural designs as well as to the movements of people in space. 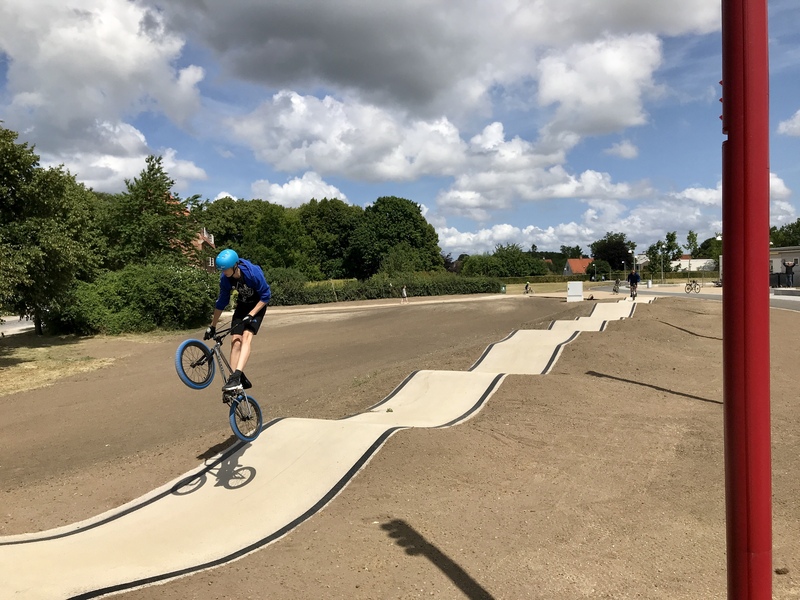 The purpose of the Musicon Path in the urban park space of the City Hall of Roskilde is to support and stimulate urban planning by hosting both short, as well as long, term events and new development of housing and activity of sports and play. In the large scale, the path connects the main train station to Viby, a city south of Roskilde. The lighting of the path has the purpose of combining functional criteria of lighting up a path, of fitting new urban lighting and remote-control systems with being an artistic and innovative feature of gateways and movements, creating positive identity to stimulate health, living and growth in the Roskilde community. The project was initiated from citizens’ engagement and the planners responding to the area needing a proper path and bikeway in replacement of the dirt trail through the grass in the park. As the Musicon area has developed south of this path, there is and will be a greater need for a public route leading people from the station to the areas south of the station, like Musicon, the Dyrskue and Roskilde Festival area as well as Viby. The chosen method of planning was that of engaging citizens by way of workshops and to collaborate with existing and new partners, extending into a collaborative work among all lighting projects, not only in Roskilde, but also other cities of Zealand and Skåne too in this Lighting Metropolis project form. This has been far more collaborative and thus somewhat more creative and open to efficient and/or innovative solutions. The project method also built relationships to professionals as well as public partners along the way, leading to other initiatives within urban planning and lighting strategies. The main theme and inspiration of the lighting designs as well as the pay-out of the pump track – one of the activities along the way – is water. Water as in flow of water. Waves, bluish colours and raindrops on the surface of water became the form language of the pump track – light, colours and movements of people in space. The theme of water is furthermore an extension of the Musicon area the path leads to – an area with a history of watershed as well as today’s runoff water and skater park activity. The construction process became more extended than usual, as the inventors of the lighting along the path way conducted testing in both 3D programming, in physical models and 1:1 space, as well as additional 1:1 testing and design refinements on site during the construction, in order to study detectors and light on trees, pathways, movements and spaces. The lighting program used is Mosaic Designer. The Lighting designers and Ørsted have worked through every single detail, finding and developing products to match design visions. Throughout the construction, Ørsted has co-managed the process along with the project manager of the municipality of Roskilde. The lighting designers – both one professional, ÅF Lighting, and the two former students of the AAU, now freelance designers – followed the construction every single step of the layout and work on site, as well as the programming and light settings. The former students were brought into the professional world by the OPI partnership and the architectural lighting designer partner ÅF Lighting. The partnership of Ørsted, Roskilde and students are both a somewhat standard community-based approach in Roskilde projects such as the Musicon area, which involves lots of creativity, citizens’ engagement and innovation. Under the umbrella of the Lighting Metropolis approach of first a Triple Helix and then an OPI partnership, as well as inspirational networking of many international partners, the collaborations for innovation became greater and even more formalized. The gateway lighting feature, Spot 3 and spot 5 are designed to resemble the flow of water. The Gormsvej Gateway (spot 3) is made of 20 smaller, round lighting fixtures embedded in the asphalt pavement. The light will fade in and out individually to each lamp, creating a sense of flow and directional movement towards the park spaces. The Ringparken Gateway at the end of Eriksvej (spot 5) is made from 10 lighting fixtures mounted on two lamp posts juxtaposed across the pathway. The 10 lamps are oval shapes, fading in and out as well as creating a sense of flow, bringing attention to the change of urban identity from open green park to more dense housing and institutions and vice versa. The interactive lighting design of the pump track defined the shape of the track to be a wave, rolling steeper and greater hills towards a high wave of two curves, then a fade back to the main path with the lighting design of detectors monitoring the biker’s movement and following the activity on the path, like drops of water on the rolling waves of the sea, turning the light on in a wave movement. Blue is the main programming colour, clear in hue, the asphalt is white and reflects the colour chosen in the programs. The 6 other programmed themes are with colours symbolic to Roskilde, to special annual events, like an orange light when the Roskilde festival adds another 100,000 citizens in a sea of music, and a still image of soft, white light, when other activities may be of interest on the site. As to technical aspects, the innovative design is a special conduct from the censor of the mast to the controls, the SMS control of programs from a cell phone is the latest, and the program added to the censors that measures people’s activity. The colour schemes of masts and lighting are selected according to the design themes. To ensure this living lab situation of the Demo Lab Musicon Path, we have adapted technology to the lighting fixtures that will measure the activity and usage by people, which may then be analysed. The result will show, if the programming is successful, or if any new programming is needed. The future design development is made possible from the point of installation and construction. That is why making innovation possible for future improvements and adaptability are key words to this design and innovation both. With ÅF Lighting and former students of AAU, now freelance designers; Esben Oxholm and Simon Panduro Nordstedt. Contractor of the landscape, lighting foundation and electrical conduit work and path; Anlægsgartner Gottlieb A/S. Contractor of the pump track, a design-build firm, Dirt Builders. Subcontractor to Ørsted, Bravida. Contractor of lighting on the main path, SEAS-NVE. Lighting products from Phillips Lighting. Contractor with the City Hall maintenance, L:CON. Local residents and community-based groups involved: Neighbours near the path and gateways; 4 citizens (40 to come), two child care institutions, Ringparken residents, a public housing project and the scouts. Local community neighbours, approx. 900 in all; residents, public institutions and businesses. And the Musicon area of even more business, residents and a university. An extended and strengthened partnership, both under the three partnership collaboration as well as under the interregional, international and national partners and networks. New knowledge of lighting designs, gaining more experience in processes of production and projects, community based designs. Conducting 1:1 testing of the mast and lighting composition on site (not only 3D digital models and factory testing of products). More citizens engaged in developing the design concepts (strengthening democracy). Local residents will be able to walk the path in good light conditions and be active outdoors 720 hours more in the winter season, which improves health conditions both psychologically and physically. More innovation by way of utilising professionals’ engagement with student creativity and time spent in thesis projects. (More time spent on innovation than in typical professional projects). Two student lighting designers develop professional experience and become independent professionals. A private developer purchasing a polluted, deteriorated site to build a housing unit, right next to the new Musicon Path and playground for young bikers. Polluted soils cleaned up in the landscape of the lighting during construction according to the local planning documents criteria of environmental clean-up processes. User pattern analysis conducted this summer in August will tell the exact engagement of the citizens in numbers. (Will follow upon completion in the final report, fall 2018.) Built-in future measurement of activities in the detectors and programming will show measurable results of the pump track usage by people, allowing us to read and correct programs and more innovation of the lighting programs. Lessons learnt are that of many little details on the way such as becoming accustomed to the program of Lighting Metropolis, the OPI partnership model and collaborating with student processes growing into a professional construction of a built landscape and lighting. Improvements to our process could be to meet more often in the smaller collaboration of the Musicon Path only prior to the construction, to have students drawings become part of the bidding process and material with the main landscape architect. The contractors were not excited about the 1:1 testing during construction as there was a delay in gathering the information into the drawing they were doing the site work from. However, Lighting Metropolis and a professional precession both demand these kind of 1:1 testing. Perhaps a more thorough involvement from lighting designers into the construction scheduling and time management both prior and during construction would be tolerated from the contractors, for them to achieve a better time and schedule planning. The students/freelancers should be more involved in meeting the contractors at the “Byggemøder”, weekly construction meetings, as they would have been able to coordinate more of their on-site work into the work of others. However, all in all, everyone mostly adjusted to the construction management and site works, in an overall timely manner. Opening ceremony and speech begin at 12 by Gormsvej and Thyrasvej, 4000 Roskilde. Walk the Musicon Path at any time from the Gormsvej and Thyrasvej intersection or from the Sdr. Ringvej and Rabalderstræde intersection, 4000 Roskilde. The potential and purpose of the pathway and activities including lighting designs are very much that of developing the area and encouraging citizens to be active in the urban spaces locally as well as regionally. Surrounding areas are all benefiting directly by being supported in transportation and free public activities, as well as paths lit up during wintertime with darkness when commuting and exercising or playing outdoors. Furthermore, areas connecting to the path north and south have similar gains.